The price of a single Bitcoin fluctuates often, sometimes even from second to second, based on market bidding (similar to stocks, gold, and foreign currencies). Bitcoin topped $19,000 in December 2017, only to plunge to $7,200 by February 2018. What makes Bitcoin unique is that the Bitcoin network––where Bitcoins are transferred––isn’t controlled by any person or company, but rather by a decentralized network of computers. A record of all Bitcoin transactions is stored on the computers of every person who helps verify Bitcoin transactions. Unfortunately, Bitcoin debit cards may be shortlived. Earlier in 2018, Visa told BitPay, one of the most popular Bitcoin debit card to close its accounts. Other crypto debit card cards have also closed and are returning funds to consumers. Bitcoin debit and credit cards available in other countries may not be available in the United States. Finding a Bitcoin debit card may be more difficult, especially considering the Bitcoin is currently unregulated by Federal agencies. Bitcoin credit cards may be a possibility in the future as credit card companies work to figure out how to work with the currency. 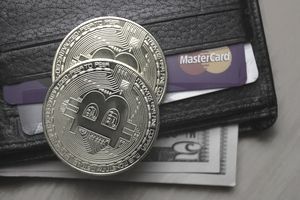 MasterCard recently filed a new patent that could allow Bitcoin transactions on credit cards. As of now, it’s just a patent and there has been no official news about bitcoin-enabled transactions. American Express has also filed a patent for using blockchain in its proof of payment system. Blockchain is the technology on which Bitcoin transactions are managed and recorded. The first Bitcoin rewards credit card––Blockrize––may not be too far away. A 25-year-old entrepreneur based in San Francisco is working on a credit card that offers cryptocurrency as a signup bonus for new cardholders similar to how other credit cards offer points or miles as a signup bonus. The card, which still doesn’t have a banking partner would pay 1% cryptocurrency rewards similar to how other rewards credit cards pay 1% cash back. There are more than 5,000 people on the waitlist, according to the card’s signup page.